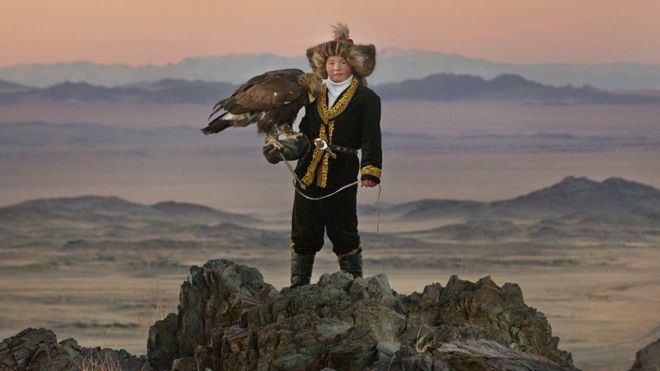 The photograph of Aisholpan and her eagle on my Twitter feed caught my eyes two years ago. I am glad her photograph caught British journalist, Otto Bell’s eyes as well. He will share Aisholpan’s story of becoming the first female eagle hunter in 12 generations in Mongolia. Two years ago, the photograph of Aisholpan’s solemn yet joyful face when she had the eagle perched on her arm fascinated and enchanted me. But the new BBC article I just read about the Star War’s “Rey,” Daisy Ridley’s reaction to seeing the film about Aishoplan affected me even more. Aisholpan’s father supported Aisholpan’s wish to become an eagle hunteress despite 12 generations of hunters being the only male. Ridley says that this reminded of her father staunchly supporting her wish to become an actress. Then I realized that although Aisholpan’s determination despite derision by elders deserves all the praise, her father is the one who made Aisholpan’s achievements possible. He must have faced incredible pressure from all the directions for daring to break the tradition, because if he did not support Aisholpan, she could not even have started. And I thought of my parents. Not always, but perhaps for the past ten years or more, I blamed them for not paying for my college education either intentionally or unintentionally. As I saw the difference between the well to do women and myself in middle ages, I began to hold grudges against my parents for not being like my high achieving friends’ parents. I became determined that I will do all I can to support my children. And although not as fully as I would have liked, I have been helping my children in their journey for self-actualization. But reading about Aisholpan and Ridley’s reaction, I realized that my parents had choices in how to raise me. They chose to give me freedom, always supporting me the best they could with what I wanted to do. They paid for my horseback riding lessons because they realized that I loved horses. They bought me a full set of Encyclopedia Britannica that was an extravagance. They helped me stretch canvas so that I could paint all I want to satisfy my desire to paint. My parent had their faults, but they encouraged me. And if I did not have this deeply rooted confidence given to me because of the way my parents treated me in growing years, I don’t know if I could have been strong enough to support the paths my children chose. Each of us has our paths and the moments that we experience epiphanies. Such moment came to me today in the form of reading about Aisholpan, the first female eagle hunter in 12 generations, and Daisy Ridley, the Star War’s Rey, who understood the family’s support behind great achievements.